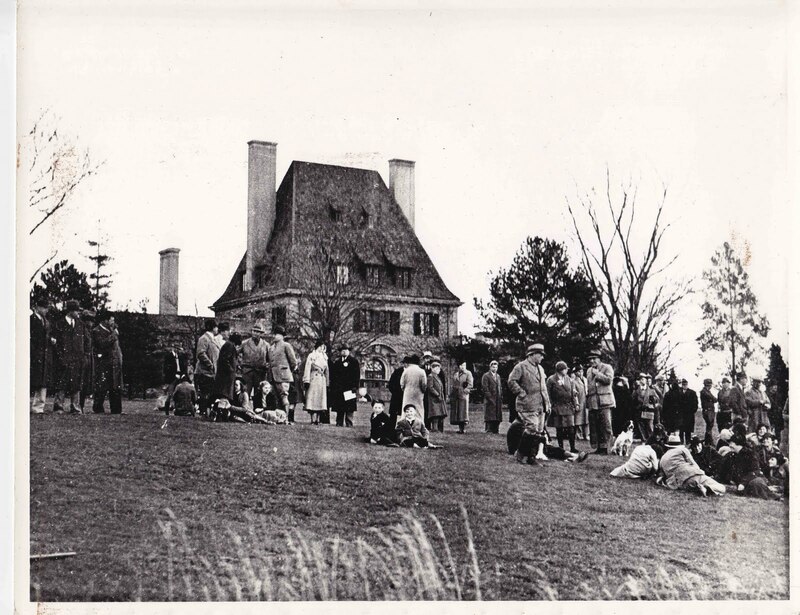 Likely watching the American Spaniel Club trials in 1932 at 'Chateau Ivor', the Charles A. Gould estate designed by John Russell Pope c. 1908 in Dix Hills. 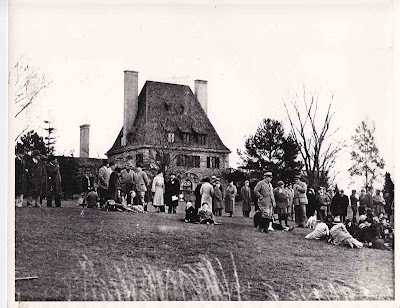 Click HERE for more on 'Chateau Ivor' (be sure to scroll past today's picture). Photo from the Gould family collection. I really don't know why I like this odd, quirky house so much. You can dissect it part by part and find fault with a great deal of the individual bits, but the whole thing seems to work, to my eye at least. My guess is that they are watching a hunt, point to point or some other horse related event. We need someone knowledgeable about fashion to put a year on this picture; the only thing I can say about the clothing is there is little fur, even on the ladies’ collars – but I think one of the women sitting on the ground at far right has a fur wrap & there may be a fur collar or two there. I like that group of women – they’re not paying attention but they're relaxed & seem to be having the best time of anyone. I don’t see any cameras or binoculars. There is a man/woman couple standing just to the left of the front door & the man is holding what appears to be a program. He also has a large button on his lapel so I’m guessing he & the woman are judges or timers of some sort. I agree this house is quirky but works somehow. Looking at the clothing and the car in front of the house, I would but a guess at the early 30's. May be an auction or something like that. Although this house is criticized alot around here, almost as much as Pembroke, Meudon and Idle Hour by some, it looks so much better in this photo surrounded by the maturing naturalized landscape. The interior spaces were quite beautiful and it commmanded an expansive view from its hilltop location. Plus I love the awesome scale of that towering roof. I'm with Magnus on the guesses, all fall and location appropriate---also possibly dog trials? I too like this oddball house---talent like John Russell Pope will out, everytime. Wonder how it would have turned out in CPH's leaden hands? Speaking of John Russell Pope, and harking back to Ancient's notice of 'visiting maid's trunk room': Last night I was skimming through 'The Letters of Pauline Palmer' (Mrs. Potter Palmer II of Chicago) edited by the late Eleanor Dwight. In it I found a letter by Mrs. Palmer to her mother, describing a visit with her friend Evie (Mrs. Marshall Field II of Caumsett, after her divorce, Evelyn Marshall Field of Easton at Syossett). In it, Mrs. Palmer talks of seeing the plans for the two new houses the Fields are building, on 70th St. in New York, designed by 'David' (David Adler, who also later designed Easton). That part of the letter is well worth printing here. For context, one must also remember that Mrs. Palmer and her husband had recently moved into his parent's marvelously ugly (there is such a thing) and totally over-the-top castle on Lake Shore Drive in Chicago, after having the interiors handsomely updated by David Adler. "Evie has grow very fat and, I think, has lost her looks. She is wildly enthusiastic about her houses and expects to have them finished a year from this summer. The city house, which David is doing, is very nice---really two houses, one on 69th St. for entertaining and the other on 70th for the family. They are connected by a gallery 50 feet long, which opens onto a court 50x30. Very unique idea. She thinks David a wonder. Her country house (Caumsett by JRP) is enormous and really looks on the plan simply awful. It must be at least 300 feet long and about 75 feet wide. She has 18 servants' rooms, so you can imagine that it will be big. That does not include her maid's room! It is to be like a great English estate. The house will be Georgian, the entrance one of those great two-storied square halls with the stairs running up two sides, and a gallery above, such as one sees in the books on English houses. She said both houses were absolutely flawless---perfect in every way. And every idea hers. She made a list of just what she wanted and gave it to her architect to put together. I didn't say that it took a pretty smart man to make a harmonious whole, but I thought it." from 'The Letters of Pauline Palmer, edited by Eleanor Dwight, published by M.T. Train/Scala Books 2005. It's personal observation like this that makes the architectural or social historian light up. I was skimming the book for material about the Palmer's Bar Harbor summer house, 'Hare Forest' and wasn't nearly as well rewarded, but at least found this to add to the Caumsett lore. archibuff, you may notice that some of 'some' actually just left a rather postive comment about the house. It's odd, but compelling. Pembroke is also odd but compelling. Meudon is just stiff. One can see the same thing done far better at the Stotesbury's Whitemarsh Hall, or the Widener's Lynnewood, both in Philadelphia. Here's an ad for a 1927 auction of some of the contents of the house and the broader estate. Tapestries, French furniture, china and silver, prints and paintings, clocks, sleighs, a gold-mounted harness, and -- not least -- 18 chickens. wow. The 18 chickens get top billing, and the cheval mirrors, odd pieces of French Furniture, and the 20 unnamed oil paintings don't even get listed. sigh. The good old days, when there were bargains to be had at auction. DED lol, yes I duly noted your positive statement although "some" have previously thought that what this house was missing was a bulldozer. Ouch. Plus I know you live to torment CPH but I believe his townhouses were his forte. Whitemarsh also is a personal favorite and a tragic, senseless loss and Lynnewood Hall is a magnificent pile that is as well maintained and loved by its current owner as Winfield Hall and Bogheid in Glen Cove are. Sadly I just wish more citizens and villages would appreciate the value that such properties have and that we wont see Lynnewood Hall or Winfield Hall one day on this blog under demolished. After looking at the ad for the auction I am now sure that is what this photo is about. 1927 in April would be about right. Yup, just looked at the picture again. I'm still voting Horse, Hunt, or Dog. Several of the spectators are in riding habits, one guy in top coat has what might be a judges badge, etc. There is a web-site called www.fashion-era.com that has a lot of information about clothing and hair styles from almost every era. I looked at the hats since that is what we mostly can see and they are very similar to the very late 20's or very early 30's to my eye at least. I wish more women were standing up. Just a hunch, but I say about 1932. Completing the field-trial season in the East, the American Spaniel Club has scheduled its annual trials for Saturday, Nov. 19, on the Ivor Estate in the Dix Hills at South Huntington, L.I., through the courtesy of Charles Gould. Everything makes sense-- people's clothes for that time of year, the dogs, the man with the badge, and congratulations to the last "anonymous" for getting the year right -- at least I think this may be it. Thank you...Thank you....I take my bows...it goes to show, always go with your gut.....1932 it is. Updated by a relative - scroll to bottom. Thanks for unearthing that Patricia.